While we were eating we heard some yelling from the road but thought it was hunters. Then, a few moments later, we saw a man walking through the woods towards our camp. He was wearing jeans and a sweatshirt and, when he got closer, we could see he was Latino. We called out, “Hello? Hello?” and got no response. We were a little on edge when he walked out of the woods, into our small clearing and stopped. Then, in Spanish, he said that he didn’t speak any English and asked if we had water. He was panting and visibly distraught. We filled up his gallon-size Igloo water cooler and he drank it in one go. Oakland!? He was trying to get to Oakland? We were on the border of the Trinity and Six Rivers National Forests, about 50 miles due west of Redding. We were six hours north of Oakland by car. He was on foot. I was having trouble comprehending the situation. He said he’d been in walking for three days. We asked if he was hungry and he said yes. Natalie gave him a wedge of cheese, some turkey jerky, and an apple. We still had crepe batter leftover, so I started making him breakfast. We introduced ourselves and Greg asked him where he was from. He said his name was Miguel and that he lived in the East Bay but was originally from Mexico. We talked about Mexico for a little while, trips we’d taken there and so on and asked if there was anyone we could call for him. He said his mother lived on the east coast but that didn’t seem like it was going to be any help at the moment. Greg called a friend of his who spoke better Spanish, put Miguel on the phone with him, and we began to piece together his story. He made the “gun” sign with his fingers as he talked. We thought he was talking about hunters but we later learned he’d been robbed. He said he’d been picked up in the East Bay, with others, on the promise that there would be work in Eureka. Then, at some point, they were held up at gunpoint and told to run into the woods or they’d be shot. Everyone ran in a different direction. He had walked from Eureka, 80 miles away, without food… in the woods… during hunting season. After breakfast he told us more about his ordeal. At about 4 or 5am that morning he had been woken up by a rustling sound. He swept the woods with his flashlight and was startled to see a big brown bear. The bear, startled too, charged him but stopped short. Miguel fled. Later that morning he was awoken again, this time by a small black bear, which ran for cover when Miguel stood up. We offered to take Miguel to the nearest Ranger Station, which he was fine with, but that wouldn’t have gotten him any closer to the East Bay. In the end Greg offered to drive him home. 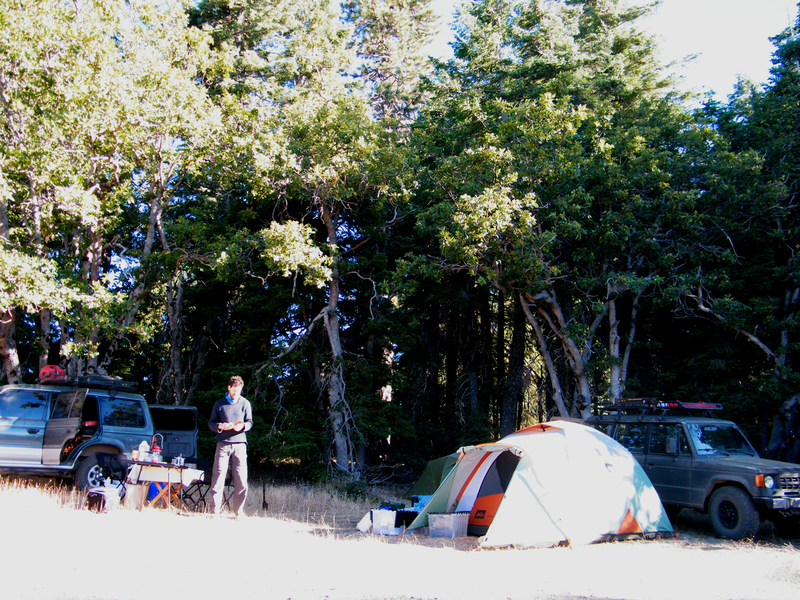 We gladly cut our trip short, packed up camp, and got on the road. Every time we stopped to get gas or check the roof rack he grabbed his cooler thinking we were going to drop him off, the poor guy. It felt really good to help him out and he was really grateful for it. Special thanks to Greg for driving the final leg to the East Bay and to his friend Joe for translating for us via cellphone. We set off on this trip to find adventure in remote country and to see where a line on a map would lead. We discovered the California back country alright, both its beautiful and troubled sides. In the end we didn’t finish the CBDT but were happy to lend a hand and restore some faith in basic human kindness. The California Backcountry Discover Trail is an easy trip that’s well within the capability of a stock SUV. If you’d like to do the trip, and finish the trail on the ridge of 5000-ft. South Fork Mountain, I’ve included the last leg in the map below. There’s also a link to the full trail, as we (mostly) drove it. From our last campsite above Ruth Lake it was pavement all the way. To see the entire CBDT trail in one map, click this link. You can also download a Google Earth-friendly .kml file from that page by clicking the down arrow in the upper-left of the screen. We veered off the official trail a bit but our route is mostly true to form. Good job! Thanks for treating this man like another human being. That’s totally what it felt like: one group of human beings helping out another human being in need. It felt gratifying. Gosh, not an easy decision. I basically agree with ‘Saguache’ here, but the real question is whether or not this guy means any harm – something that is not always simple to determine. Glad all turned out well in this case! And I think readers here (and anyone going into the backcountry) should spend a moment to think about how they would handle such a situation. That was our concern at first too and we made our camp safe by putting away all the knives but then we could tell from his body language and emotional state that he had really been through an ordeal. We offered our help and he offered his, helping us pack and clean up camp. It all worked out for the best, which I feel is the way things work out most of the time. Well Nik, I am a Mexican, and if he really had that problem or just an illegal inmigrant, thank you all guys for helping him, at the end, its an human thing to do. I’m glad we were able to help him out, Juan. It felt really good. Thanks for commenting. Ah, good point… I forgot that we looked that up at the time. He most likely saw a brown black bear as opposed to a brown bear, which, as you suggest, aren’t known to exist in California, let alone on the US west coast. Both bears tend to avoid humans. Black bears avoid conflict more than brown bears though black bears may mock charge.